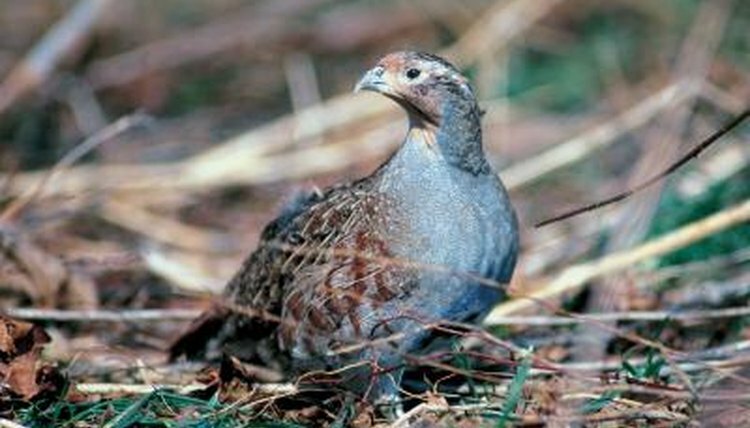 Introduced to the United States in the early 1900s, the Hungarian partridge -- also known as the gray partridge -- is found in agricultural areas along the length of the U.S.-Canadian border. Although the birds are hardy once established in fields where they can forage for insects and grain, they usually have high mortality when you're establishing the first generation or raising them in pens. They're not recommended for the novice game-bird enthusiast. You can order baby Hungarian partridges from game bird hatcheries, usually in quantities of 50 at a time. The partridges are intolerant of crowded conditions, so provide a 1/2-foot of space per bird, increasing it to 3/4 square feet per chick after four weeks. Preheat your brooder to 99 degrees at least 24 hours in advance so food, water, walls and airspace are at a constant temperature. Reduce the temperature by 5 degrees each week until the brooder is kept at 70 degrees by the time the chicks are 6 weeks old. Initially, your babies can drink water from jar lids placed around their environment. Upon arrival, dip each chick's beak into one water to encourage it to drink. For the first two to three days after arrival, add 5 tablespoons of sugar per quart of water to help the chicks regain energy lost when traveling. As babies grow, graduate to a commercial chicken waterer or use a bowl with stones placed inside to prevent chicks getting chilled or drowning. Feed game bird starter served up on a paper towel for the first few days. Sprinkle crumbled hard-boiled egg yolk on top of the feed to give chicks extra protein for a good start. Keep chicks on gamebird starter for the first four months of life, serving it in shallow metal troughs when they get large enough. Free-ranging parents bring their offspring a variety of insects to supplement their diet during this time, so feel free to supplement the chick starter with fresh maggots or grubs. If you plan to keep your Hungarian partridge confined, plan 6 square feet of space per bird and plant with tall grass and other vegetation to provide cover and forage. Unless you have only one male, you'll need separate breeding enclosures at least 6 feet long and 2 feet wide for each pair to prevent fighting as soon as you hear males begin crowing in the spring. Birds released into cultivated fields will pair up and reproduce naturally, but you should delay cutting hay until the chicks mature.